KFC and Jason Alexander Team Up to Answer the Age-Old Question, "What's for Dinner?" August 6, 2018 – Louisville, Ky. – Kentucky Fried Chicken® announced today that it has selected actor, comedian and director Jason Alexander as the latest celebrity to play the role of the brand’s iconic founder, Colonel Harland Sanders. Beginning August 6, ads featuring the sitcom veteran as the Colonel and dinnertime hero will air on television and computer screens nationwide to promote KFC’s $20 Fill Ups™, which for the first time are available in four different varieties. Modern families want and need mealtime to be simple and stress-free. KFC knows this can be a feat when the clock strikes 5 p.m. and wants to help families solve the dinnertime challenge without sacrificing taste. To do just that, KFC has enlisted sitcom king Alexander to offer its $20 Fill Ups four different ways, including a new boneless filet $20 Fill Up. 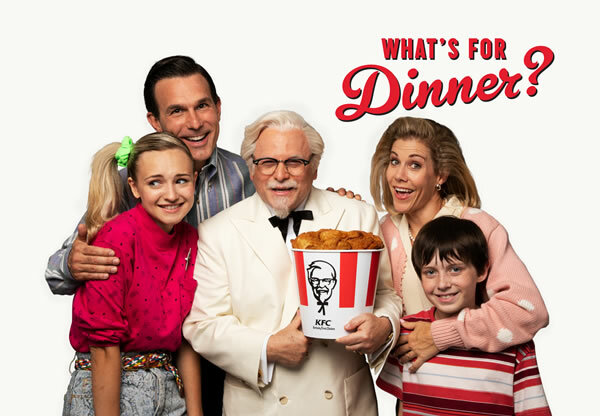 Alexander’s background as a star of one of the greatest sitcoms of all time makes him the perfect choice to play KFC’s “Family Colonel” and bring this family dinner conundrum to life. Since every family is unique, KFC’s famous $20 Fill Up is available in four different, equally delicious options: new boneless breast filets, Original Recipe® chicken-on-the bone, Extra Crispy™ chicken-on-the bone and Extra Crispy tenders. All four varieties also come with sides and biscuits. Smaller families can also enjoy KFC’s $10 Chicken Share bucket designed for two. KFC Corporation, based in Louisville, Ky., is the world's most popular chicken restaurant chain. KFC specializes in Original Recipe®, Extra Crispy™, Kentucky Grilled Chicken® and Extra Crispy™ Tenders, Hot Wings™, Go Cups, KFC Famous Bowls®, Pot Pies, freshly hand prepared chicken sandwiches, biscuits and homestyle side items. There are over 21,000 KFC outlets in almost 130 countries and territories around the world. KFC Corporation is a subsidiary of Yum! Brands, Inc., Louisville, Ky. (NYSE: YUM). For more information, visit www.kfc.com. Follow KFC on Facebook (www.facebook.com/kfc), Twitter (www.twitter.com/kfc) and Instagram (www.instagram.com/KFC).